Never return home to find out you forgot something | Buy Me a Pie! Share the post "Never return home to find out you forgot something"
Has this ever happened to you? It has happened to me. After doing my grocery shopping, I got home and found that I had forgotten that one vital ingredient for my meal that evening. 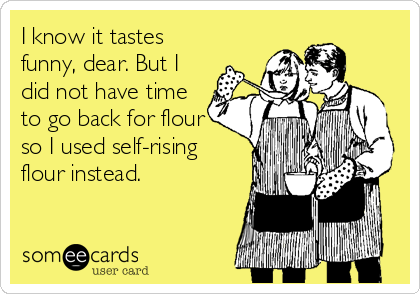 And it always seems to happen on days when I really do not have the time to go back and pick up that last ingredient. Which is unfortunate as there is no other option than to turn around and go straight back to the store. Luckily this is a problem that you don’t ever need to have. Especially if we are talking about repetitive groceries. You know, the things that you usually have in your house because you need them every time you prepare a meal, clean the house or prepare to go out. The secret to always having the groceries you need in your house lies in your shopping list. The best way to keep track of the groceries you need to get, is to put them on a shopping list as soon as you run out. For me, this used to be wishful thinking at first. When I would run out of something, I would think I was going to write it down a little later. That meant that I had already thrown out the package and had forgotten about it before I got to my grocery list in the kitchen. The best solution would be to have your grocery list with you at all times. The good news is that that is much easier to do than you would think. By carrying your phone around, you can always have your grocery list with you. 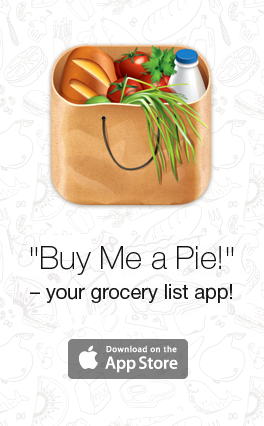 With the «Buy Me a Pie!» app, putting the groceries on your list is as easy as a single tap, or changing the amount of the item that is already on your list. One of my personal favorite features of the «Buy Me a Pie!» app, is to be able to synchronize shopping lists. That way you, your partner, your kids or others you live with, can make sure everything is on the shopping list. A great way to make sure everybody in the house is happy as you will never forget that product they specifically asked you for. They just put it on the list for you. This whole process is going to save you a lot of time. It will save you the time you usually need to go over everything that is in the house, to find out what you need to buy. It will save you time in the store as you know what you need to get. And it will save you time by making sure you can get everything you need in one visit to the supermarket. And all this for making a habit your own that only costs you seconds every day, but saves you minutes every week. Have fun shopping and be happy in the knowledge that you are brining home everything you need.